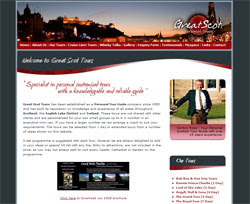 The team at The Edge have refreshed the design layout of greatscot-tours.com to improve useability and to highlight a new side to Gordon Ross's Personal Tour Guide business - Whisky Talks. Useability has been improved by increasing the size of navigation links and improving the contrast between link colours and their backgrounds and an additional section Whisky Talks promotes Gordon's whisky tasting tours and seminars throughout Scotland. "Today we announced that VisitScotland has reached agreement to bring the national tourism website VisitScotland.com back into public ownership. The website, which attracted over 11 million visits in 2007 and has delivered over £65 million in bookings since it was launched, will be brought under the direct control of VisitScotland in a move to allow it to adapt more flexibly to changing consumer trends and tourism industry needs. The changes will also give VisitScotland more flexibility to assist businesses and to respond to the current economic downturn. As technology advances VisitScotland.com needs to respond to those changes and be able to work with market leaders to deliver a high-quality website that can change and develop quickly. Changing internet usage and developing consumer trends have meant that the original model developed over six years ago—that of a ‘one-stop shop’ that meets all the customer needs for information, booking and sales—now needs to evolve to ensure that VisitScotland.com remains able to fulfil the needs of the Scottish tourism industry in the 21st century. Following discussions with its partners in the joint venture – Tiscover, Partnerships UK and Atos Origin – VisitScotland has reached agreement on the terms of a deal to take control of the operation. VisitScotland is currently working with the partners to ensure a smooth transition. VisitScotland is committed to ensuring continuity and stability throughout the changes and we will engage fully with VisitScotland.com staff. The website will continue to operate as usual, tourism businesses and consumers will see no immediate change, although the website will continue to evolve and develop over time. Further information on the changes announced today is contained in the attached briefing document. If you have any questions on any of the above, please do not hesitate to get in touch." Sometimes months just vanish...October was one of them! From start to finish it has been non stop for all of the team at The Edge. 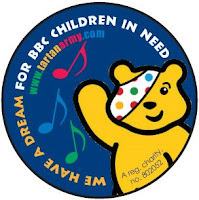 From design and print jobs, new website developments and some interesting project management; so with apologies for the retropsective nature but we thought it worthwhile giving a brief overview of the past few weeks - and where better to start with our now annual Children in Need project! 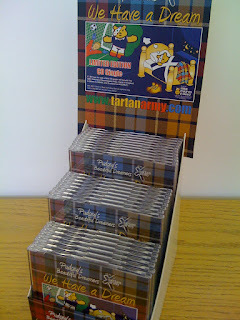 Last year we had the idea with The Tartan Army to record a single for Children in Need - with only six weeks to plan it we ended up with an unbelieveably succesful result, culminating in a Top Ten UK chart hit and almost 50,000 single sales of Loch Lomond with Runrig. So having done it once we thought we'd try it again! This year we approached BA Robertson and the BBC to come up with a re-recording of We Have a Dream - the famous 1982 World Cup song. The track will be released just before Children in Need but the work leading up to perhaps showcases many of our strengths - Project management in pulling the whole thing together; website redevelopment; Web 2.0 tools in the form of a dedicated blog; big screen graphics for half time at Hampden for the Scotland vs Norway game; design of the CD cover and original artwork; production of Point of Sale materials for supermarkets and stores; copy writing, press and PR campaign for a plethora of related Tartan Army stories; TV and Radio interviews, design and production of t-shirts; database development and emarketing campaign and even dressing up as Pudsey on one or two occasions. We Have A Dream... could The Edge help you with yours? It's always nice when you get an enquiry based on a recommendation so we were delighted to receive a call from Nairn hotelier Ian Bochel who was looking to update his website. He'd heard about The Edge from a fellow Nairn hotelier and after a in depth introductory discussion about our ethos we agreed a way forward. The result is a brand new website with a fresh feel that reflects the hotel's dynamism, incorporates Bookassist online reservations and is built around the Sitebuilder Standard web package. Sitebuilder allows hotels the opportunity to manage their own content and, when ready, upgrade further to the Pro version with its additional Web 2.0 tools. 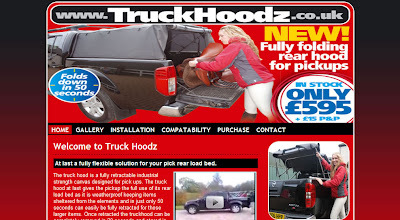 Ian knew he needed an online booking engine but was confused by the plethora of options available to him. We discussed his requirements fully with him and once the key benefits of Bookassist were outlined he was confident that he had a fully integrated and future proof online package. So from introduction to new website was less than six weeks and we've looked after not only design and content management but online reservations, search engine optimisation, domain transfers and training. Ian can head off on his own holiday confident that his web presence is in safe hands.